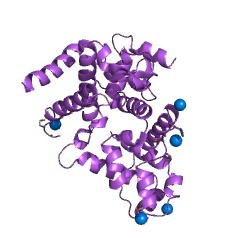 Domain in Tre-2, BUB2p, and Cdc16p. Probable Rab-GAPs. Widespread domain present in Gyp6 and Gyp7, thereby giving rise to the notion that it performs a GTP-activator activity on Rab-like GTPases. 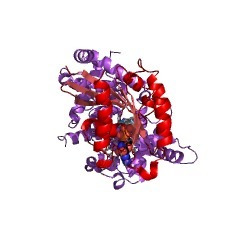 The ~200 amino acid TBC/rab GTPase-activating protein (GAP) domain is well conserved across species and has been found in a wide range of different proteins from plant adhesion molecules to mammalian oncogenes. 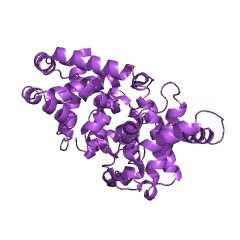 The name TBC derives from the name of the murine protein Tbc1 in which this domain was first identified based on its similarity to sequences in the tre-2 oncogene, and the yeast regulators of mitosis, BUB2 and cdc16 [(PUBMED:7566974)]. The connection of this domain with rab GTPase activation stems from subsequent in-depth sequence analyses and alignments [(PUBMED:9255064)] and recent work demonstrating that it appears to contain the catalytic activities of the yeast rab GAPs, GYP1, and GYP7 [(PUBMED:10508155)]. 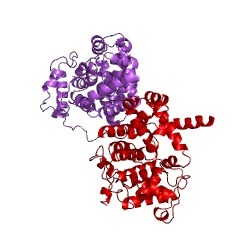 The TBC/rab GAP domain has also been named PTM after three proteins known to contain it: the Drosophila pollux, the human oncoprotein TRE17 (oncoTRE17), and a myeloid cell line-expressed protein [(PUBMED:8654926)]. The TBC/rab GAP domain contains six conserved motifs named A to F [(PUBMED:9255064)]. 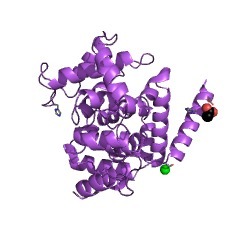 A conserved arginine residue in the sequence motif B has been shown to be critical for the full GAP activity [(PUBMED:10508155)]. 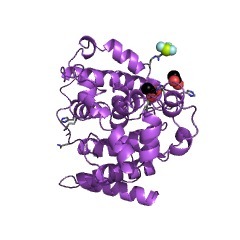 Resolution of the 3D structure of the TBC/rab GAP domain of GYP1 has shown that it is a fully alpha-helical V-shaped molecule. The conserved arginine residue is positioned at the side of the narrow cleft on the concave site of the V-shaped molecule. 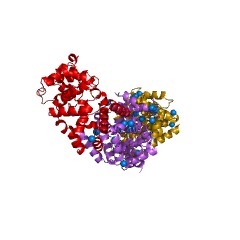 It has been proposed that this cleft is the binding site for the GTPase. The conserved arginine residue probably functions as a catalytic arginine finger analogous to that seen in ras and Rho-GAPs. The two key features of the arginine finger activation mechanism appear to be (i) the positioning of the catalytically essential GTPase glutamine side chain via a hydrogen bonding interaction between the glutamine carbamoyl-NH2 group and the main chain carbonyl group of the GAP arginine, and (ii) the polarization of the gamma-phosphate group or the stabilization of charge on it via the interaction of the positively charged side chain guanidinoyl group of the GAP arginine [(PUBMED:11013213)]. There are 36093 TBC domains in 36071 proteins in SMART's nrdb database. Taxonomic distribution of proteins containing TBC domain. This tree includes only several representative species. The complete taxonomic breakdown of all proteins with TBC domain is also avaliable. Click on the protein counts, or double click on taxonomic names to display all proteins containing TBC domain in the selected taxonomic class. Identification of a Sec4p GTPase-activating protein (GAP) as a novel member of a Rab GAP family. 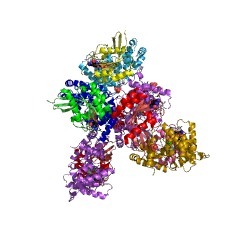 A yeast open reading frame sharing homology with the two known yeast Rab GTPase-activating proteins (GAPs), Gyp6p and Gyp7p, was found in a data base search. 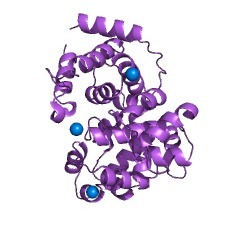 We have named the gene containing this open reading frame GYP1. Recombinant Gyp1p showed GAP activity on Sec4p, increasing both its steady-state rate and single turnover GTPase activity. Gyp1p also stimulated the GTPase activity of several other yeast Rab proteins including Ypt1p, Ypt7p, and Ypt51p but showed no GAP activity on Ypt6p and Ypt32p. Deletion of the GYP1 gene or overexpression of Gyp1p did not alter the growth rate of yeast. However, overexpression of Gyp1p was inhibitory in combination with a subset of secretory mutants including sec4-8 and several ypt1 mutants. This effect is probably due to the increase in GAP activity, which can be observed in a lysate from cells overexpressing Gyp1p. The finding that yeast Rab GAPs share homology with proteins in other species, such as Caenorhabditis elegans and human, suggests the existence of a conserved Rab GAP family. Vesicular transport: how many Ypt/Rab-GTPases make a eukaryotic cell? In eukaryotic cells, protein transport through the secretory and endocytic pathways is mediated by vesicular intermediates. Individual transport steps are regulated by Ras-like guanine nucleotide-binding proteins, termed Ypt in yeast or Rab in mammals. The complete sequencing of the Saccharomyces cerevisiae genome has revealed the total number of Ypt GTPases in this organism. There is some redundancy among the 11 Ypt proteins, and only those involved in the biosynthetic pathway are essential for cell viability. A shared domain between a spindle assembly checkpoint protein and Ypt/Rab-specific GTPase-activators. The diversity of Rab proteins in vesicle transport. Rab proteins have been primarily implicated in vesicle docking as regulators of SNARE pairing. Recent findings, however, indicate that their function in vesicle trafficking can go beyond this role, and a number of proteins, unrelated to each other, have been identified as putative Rab effectors. Although the GTPase switch of Rab proteins is highly conserved, functional mechanisms may be highly diversified among members of the Rab family. Molecular cloning of a cDNA with a novel domain present in the tre-2 oncogene and the yeast cell cycle regulators BUB2 and cdc16. In an effort to identify genes that are differentially regulated during mast cell development, subtracted cDNA prepared from wild-type murine P815 mastocytoma cells and a P815 subline that exhibits properties of mast cell differentiation was used to screen mast cell cDNA libraries. Several known mast cell-specific cDNAs were isolated including mast cell carboxypeptidase A (MC-CPA), murine mast cell protease-5 (MMCP-5), and gp49. A novel cDNA, designated Tbc1, was identified that showed differential expression in the two mast cell lines. The amino acid sequence predicted from the cDNA contains a 200 amino acid domain that is homologous to regions in the tre-2 oncogene and the yeast regulators of mitosis, BUB2 and cdc16. 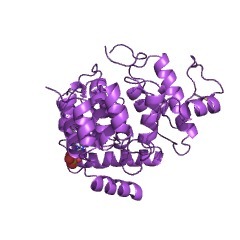 The N-terminal region contains a number of cysteine and histidine residues, potentially encoding a zinc finger domain. 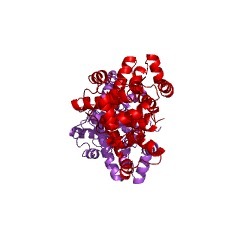 Tbc1 is a nuclear protein and is expressed in highest levels in hematopoietic cells, testis and kidney. Within these tissues, expression of Tbc1 is cell- and stage-specific. Based on sequence similarity, pattern of expression and subcellular localization, Tbc1 may play a role in the cell cycle and differentiation of various tissues. A yeast GTPase-activating protein that interacts specifically with a member of the Ypt/Rab family. 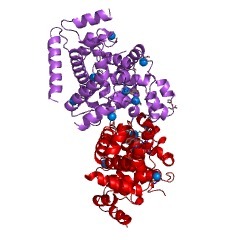 Members of the Ras superfamily of GTP-binding proteins are involved in a variety of cellular processes, including signal transduction, cytoskeletal organization and protein transport. GTP-binding proteins of the Ypt/Rab family direct vesicular protein transport in the secretory and endocytic pathways in the yeast Saccharomyces cerevisiae (Ypt proteins) and in mammalian systems (Rab proteins). The cellular activity of monomeric GTP-binding proteins is influenced by proteins that regulate GDP/GTP exchange and GTP hydrolysis. GTPase-activating proteins (GAPs) can increase the slow intrinsic GTPase activity of GTP-binding proteins by several orders of magnitude. As GAPs modulate the activity of GTP-binding proteins, they are thought to give a biochemical handle on the functioning of Ypt/Rab proteins in transport vesicle budding and docking or fusion at donor and acceptor membranes. 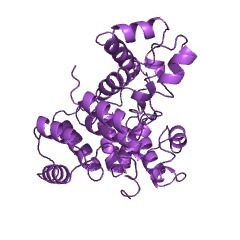 We report here the first cloned GTPase-activating protein for the Ypt/Rab protein family. 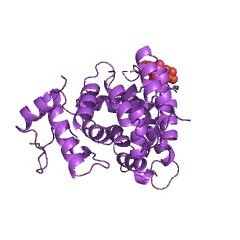 The gene, GYP6 (GAP of Ypt6 protein), encodes a protein of 458 amino acids which is highly specific for the Ypt6 protein and shows little or no cross-reactivity with other Ypt/Rab family members or with H-Ras p21. This information is based on mapping of SMART genomic protein database to KEGG orthologous groups. Percentage points are related to the number of proteins with TBC domain which could be assigned to a KEGG orthologous group, and not all proteins containing TBC domain. Please note that proteins can be included in multiple pathways, ie. the numbers above will not always add up to 100%. 4p17 Crystal structure of the Chlamydomonas flagellar RabGAP TBC domain.